The X-Fusion Velvet fork series is X-Fusions 32mm chassis XC and Trail Fork. Having 140mms of travel, remote or lever actuated lockout (convertible), the Velvet forks are prepared to go for as long as your legs can keep spinning those gears. Remote lock-out is optional, kit is not supplied with fork. 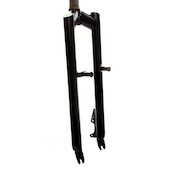 The X-Fusion Sweep fork series was the new 27.5 inch wheel fork for 2014. It spawned from the 26 inch Slant series that was developed to bridge the gap between lightweight trail forks and high performance all-mountain forks using a 34mm chassis. The Sweep has been given a dedicated offset of 46mm that you will now find on all X-Fusion 27.5 inch forks. Included on the X-Fusion Sweep fork is the LockX axle system allowing riders to quickly and safely remove and install their front wheels on the fly. Lastly, the Sweep comes equipped with X-Fusions brand new Roughcut damper or the test winning and efficient RL2 damper system, all in a svelte, but stout chassis.